In Search of David Jones: Artist, Soldier, Poet (2008) explores Jones’s early artistic development, his time in the First World War trenches and his becoming a poet. David Jones Between the Wars: The Years of Achievement (2012) celebrates his artistic and literary achievements during the interwar years. More word soon on the third film. Christmas Letter from David Jones Society. Here is a Christmas Letter from Anne Price-Owen from the David Jones Society based in the UK. Note that it includes information on subscribing to to the David Jones Society. Thanks, Anne, for this comprehensive account of David Jones Society activities this past year. It’s been a surprisingly busy year for the DJS, with all sorts of events going on in addition to all kind of plans being made to commemorate the centenary of the Great War, in 2014. Mike Guilfoyle (foblc), has contributed some very gratifying comments. Adam Alive, co-director of David Jones Between the Wars, kindly drew my attention to Foblc’s website, which includes more news on DJ celebrations in 2014. Another event which bodes well for increasing scholarship related to DJ is the establishment of The David Jones Centre at Aberystwyth University. The Centre will provide a new arena for research in two interrelated domains: the relation between word and image, as well as modernism and its legacy in Wales. Two PhD students focused their presentations on DJ, with highly original material being brought to light for the first time. We are grateful to the Friends (foblc) of Brockley & Ladywell Cemeteries who co-organized a one day seminar, the theme of which was Borders, in the Dissenters’ Chapel at Ladywell Cemetery where DJ is buried. Apart from showing sites of interest in the vicinity, the Friends, who provided refreshments, also gave us a tour of the graveyard. The next day in nearby Rotherhithe, the DJ Walk, which took in a large numbers of sites that inspired place-names and other references in DJ’s poetry, was a great success and, despite the incessant rain, the walkers enjoyed societal camaraderie. We visited many of the places on the itinerary, taking account of DJ’s childhood haunts and early life, but abandoned our plans to take a ferry back to central London, in the rain! This walk was initially inspired by Martin Haggerty, who was responsible for the first walk in Rotherhithe, and we are also indebted to Juliet Johnston & Vivian Wright for their in-depth research and careful organization of this event. Vivian Wright is well-known as the Leader of the DJ Harrow Walk, and is hoping to arrange another Harrow walk next year. This should prepare us for events that are currently in the pipeline for the anniversary of the Great War in Harrow, in 2014. Artist Jonathan Hutchins is spearheading this proposal, and has already gained support from the Leader of Harrow Council, Bill Stephenson, who has received a letter of support from one of The DJS’s most distinguished members, +Archbishop Rowan Williams. As we are all aware, +Rowan will son be standing down from his arduous position as Head of the Church of England and the Anglican Church. His tenure has been anything but smooth, yet he has been a guide and a shepherd whose sincere integrity has been driven by godly wisdom. In following his conscience he has the courage to voice his convictions, in spite of turbulent opposition. We wish him every success, and a peaceful transition to his new appointment in Cambridge in 2013. Jonathan Hutchins would welcome any proposals that might advance the commemorations in Harrow, which include obtaining a DJ blue plaque in 2014. If you would like to contribute to the think tank, then you can contact Jonathan at jonathan.hutchins@harrow.ac.uk. With 2014 in mind, it is hoped to re-publish David Jones: A Fusilier at the Front (formerly published by Seren in 1995). The 1995 edition is incomplete in the number of drawings in this volume, and Derek Shiel has been asked to write a new commentary on the 2013-14 edition which will consist of all 86 sketches. We also hope to exhibit these works in total, and if anyone can suggest a gallery which might hang this exhibition, then please contact the DJS. As Christmas is almost upon us, I can recommend some cards and presents you may wish to consider. The first is Thomas Dilworth’s latest well-informed contribution to DJ studies, David Jones in the Great War (Enitharmon, 2012), £15.00, ISBN: 978 1 907587-24-5. It’s a wonderful complement to what we already know of DJ’s situation in the Great War. Apart from offering us new perspectives on DJ, the text is lavishly illustrated with photographs of DJ, as well as artworks, including an endpaper with a reproduction of early drafts from In Parenthesis. What’s more, among the people to whom Tom dedicates his book is our enthusiastic, erstwhile honorary president, Prof William Blissett. But don’t just take my word for it – get a copy for yourself. You will not be disappointed. Monnow Valley Arts has added a number of new greetings cards to its portfolio, and you will doubtless find some of interest by going to www.monnowvalleyarts.org. If anyone is in the vicinity of Cardiff over the next season, then visit the National Museum of Wales to see the Artist in Focus show featuring Jonah Jones(1919-2004). He was a great admirer of DJ, and his lettering in particular, may be viewed almost as a tribute to our poet-painter. 7 Dec – 4 April 2013. And in Chapter Arts Centre, the intriguing exhibition of Joanne Tatham & Tom O’Sullivan, A Tool for the Making of Signs, features two pieces by David Jones: the watercolour, Chalice with Flowers & Seal(1950), and artist Kathryn Ashill reciting The Hunt(1965), 7 Dec- 24 Feb., 2013. Finally, some exciting news concerning the David Jones Society: its website and Journal. I am indebted to ‘Jason And Becky’ who are currently orchestrating the DJS website. I shall take great delight in informing you all as soon as we go live. The website domain has been purchased: thedavidjonessociety.org. I am supplying the designers with material, but also welcome any ideas you may have that will enhance the website. And finally, we have another co-editor for the Journal. Sarah Williams prompted me to fast-forward the next DJJ, and offered to help edit and collate the contributions I’ve received over the last 4 years! (Frightening, isn’t it!) I am deeply grateful to Sarah and have pleasure in reporting that the next Journal should be with you in March 2013. Following on from the Spring issue, the following journal will be devoted to War, as we have plenty of material on the subject. Given the fact that 2014 is almost in sight, that issue will be on the topic of War. Accordingly, we welcome further contributions on the subject for consideration in the 2013-14 edition. As you are aware, requests for subscriptions to the DJS have been put on hold owing to the fact that I haven’t published a journal since 2007! (However, I trust you will be grateful for the ‘extras’ I have included in your postbags when I have sent out the DJ Xmas newsletters.) Accordingly, I now put out a call for subscriptions to the DJS to cover 2012-13. The cost of joining the DJS remains a paltry £20.00pp, corporate membership is £40.00. For that, members will receive a copy of the Journal and hard copies of newsletters and any other material about events and activities relating to the DJS. If you do not join the DJS, you will still be informed of DJS activities by email, but will not receive the Journals, or any hard copy. For anyone paying in Euros, please pay E36 & make your cheques out to Anne Price-Owen, so that there will be no bank charges on changing currency. For those living elsewhere, may I suggest you change your own currency into £pounds sterling and post the cash to the DJS. Alternatively, if you are paying in $US, then the cost is 45$US, which should cover bank charges. For anyone insisting on paying by Visa, then please contact me so that we may come to a mutually beneficial arrangement. And all best wishes for a Happy and Blessed Christmas, and a peaceful 2013. I wish to join/continue membership of The David Jones Society 2012-13, and enclose a cheque/cash for £20.00, payable to the DJS. The David Jones Society in North America was started at a gathering at the Cathedral College of Washington National Cathedral on St. David's Day, March 1, 2009. We want to be a web presence and source of information and networking for scholars interested in David Jones everywhere, but especially in North America. We hope this will be a vehicle for sharing information and ideas about David Jones's life, art and poetry. Artist and writer David Jones (1875-1974) is less well known than he should be among his modernist contemporaries, though his work was hailed and promoted by W.H. 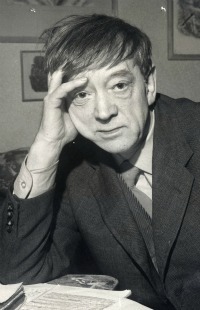 Auden, T.S.Eliot, and many others. His unusual and compelling visual and poetic work is in many ways ahead of the modernist era in which he worked. Drawing on a variety of cultural and historical contexts, including Welsh legend and myth, Roman history and Catholic Christian theology, his visual art and his poetry develops and explores explore the “sacramental” practice of the artist in a world torn by violence and cultural fragementation. His essay “Art and Sacrament” has been hailed by Rowan Williams as “one of the most important pieces of writing in the twentieth century on art and the sacred.” His major poems, In Parenthesis, The Anathemata, and The Sleeping Lord offer an experience of lyric beauty and epic scope that is rare and compelling. We in the David Jones Society, on both sides of the Atlantic, work to promote interest in Jones's work among both scholars and lovers of art, poetry, and the life of the spirit.